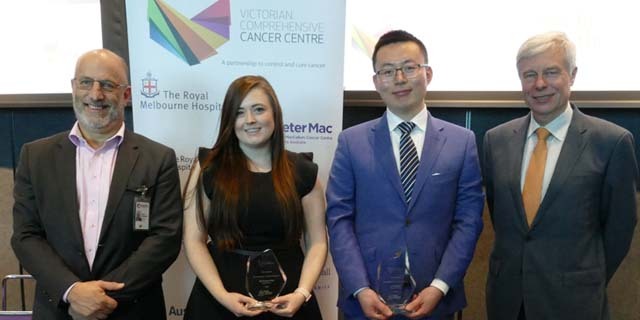 Three outstanding PhD researchers at MDHS were awarded the prestigious Picchi Award in cancer research at a ceremony last month. The recipients were chosen from the categories of basic science, clinical science and population health. The prestigious Picchi Awards, supported by the Picchi Brothers Foundation, aims to inspire and encourage the next generation of cancer research leaders. Each award winner receives $10,000 to learn and build networks; providing support towards research independence. This year’s winners have identified learning and collaboration opportunities in Italy, Malaysia, England and the US. Professor Mark Rosenthal, VCCC Clinical Trials Lead, Medical Oncologist, Peter MacCallum Cancer Centre hosted a panel of the first Picchi winners from 2012; Dr Anna Boltong, Dr Lorey Smith and Dr Aung Ko Win who reflected on the value of the Picchi and its significant and enduring impact on their careers. Captions: L-R Professor Mark Rosenthal VCCC, Medical Oncologist, Peter MacCallum Cancer Centre, Ms Simone Park, The University of Melbourne – Doherty Institute, Dr Shuai Li, The Melbourne School of Population and Global Health, The University of Melbourne and Mr Joseph Lukaitis, Chair of the Picchi Brothers Foundation.